The Canadian dollar continued its downward slide on Friday, reaching 88.81 cents or a six-month low at close of trading, having slipped 0.72 cents in early trading. News of Canada’s August trade deficit pushed the loonie down. Exports fell while imports increased in August. Canada posted its first trade deficit in four months. After registering a C$2.2 billion surplus in July, August saw a deficit of C$610 million. Imports rose to a record C$44.8 billion, while exports fell to 44.2 billion. ‘Loonie’ means one Canadian dollar. In 1987 a gold-colored coin was introduced bearing The Common Loon, a bird that is common in the country. 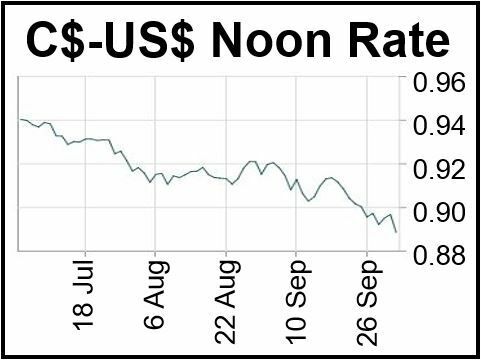 Since the beginning of September, the loonie has fallen by three US cents. Canada’s negative economic data on Friday contrasted with the US, which posted a 5.9% unemployment rate (lowest since July 2008) and strong economic growth. The US dollar has been rising against all other major currencies and is expected to continue doing so for at least the next two years. Toronto’s S&P/TSX composite index had a better Friday, rising 29.14 points to 14,789.78, reversing three successive days of falling share prices that saw the TSX reach a four-month trough. The Dow in New York rose 1.24% (206.97 points) on Friday to 17,009.69, the S&P posted a 21.73 point increase to 1,967.90, while Nasdaq went up 45.43 points to 4,475. Negative headwinds, including an anemic Eurozone, the fight against ISIS, Hong Kong’s street protests, and the economic sanctions against Russia have now been discounted by investors. Commodity prices fell as the NYME November crude fell $1.46 to $90.63 per barrel. December copper, at $3 per pound, remained unchanged. December bullion declined by $20.20 to $2,194.90 per ounce. Growing speculation that the US Federal Reserve will raise interest rates within months, forecasts of a declining euro, and imminent stimulus moves by the ECB (European Central Bank) will continue pushing the US dollar upward.